I hear that genuine zebra hide upholstery is making a comeback. English milady designed $50,000 car to help cheer up the toiling masses. How did she lose it ? 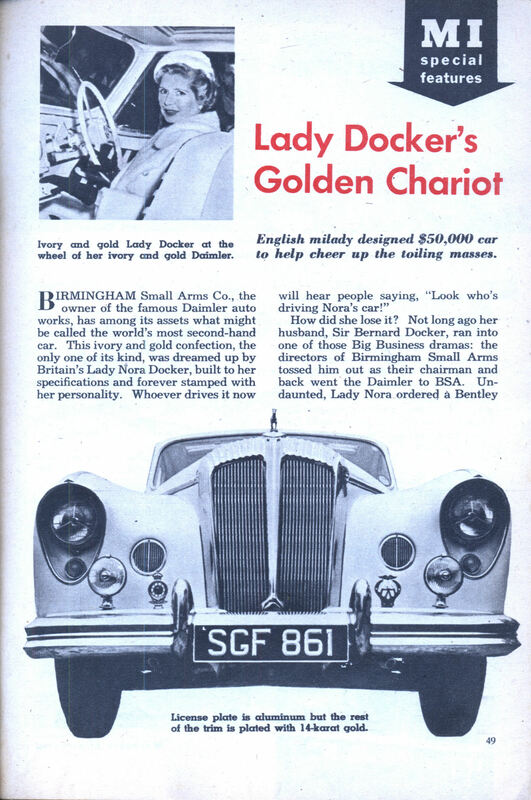 Not long ago her husband, Sir Bernard Docker, ran into one of those Big Business dramas: the directors of Birmingham Small Arms tossed him out as their chairman and back went the Daimler to BSA. Undaunted, Lady Nora ordered a Bentley Continental, also a plush job. 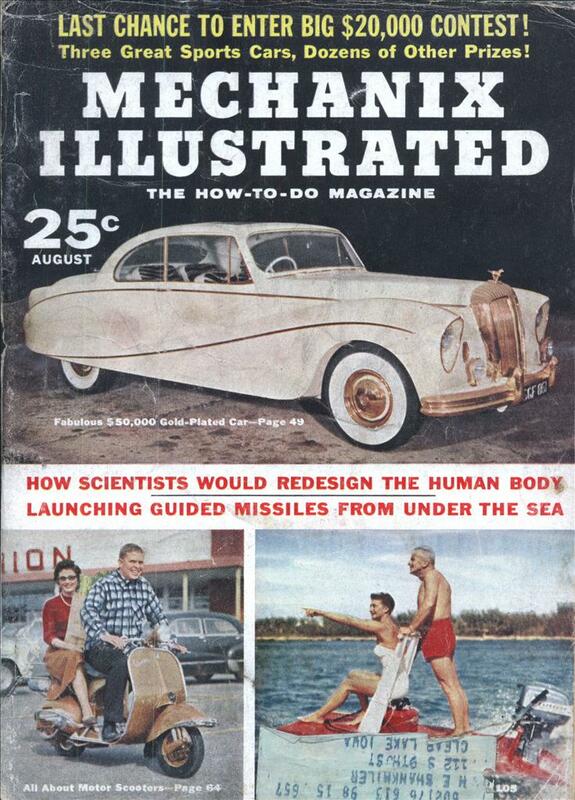 As for the Daimler’s detailsâ€”it has an aluminum alloy body and all metal work is gold-plated. The 6-cylinder engine has 167 hp. Roof panel and windshield are of heat-reflecting glass, upholstery is natural zebra hide, carpeting is unnatural nylon fur. Indirect lighting enhances the impression that you’re in a naughty French comedy. All in all, about the lushest piece of transportation since Cleopatra’s Bargeâ€”or until Lady Nora designs herself another car plated with platinum. Seems to be a common British design to have umbrellas contained within doors. Today’s Rolls Royce has the same arrangement as this 1956 Daimler. So is she Lady Docker or Lady Nora? Jeez, even back then they didn’t bother to try to get it right. Those who don’t like titles should not use them. They shouldn’t go out of their way to use them wrong. The article describes every inch of the pimped ride, but doesn’t say why the car’s World’s Most Secondhand Car. Does she let a different member of the toiling masses borrow it every day? I think it’s ‘secondhand’ because she wasn’t able to keep it because of her hubby’s job trouble- I think Diamler ended up with it and are trying to sell it. I wonder if this thing is still out there, somewhere, or if it ended up junked at some point in the 70s. The bar is a nice touch. A bar, and an umbrella holder…. two more things my Chevy Cobalt doesn’t have. The car is now in the Louwman Collection. Do you have details of the yacht that Lady Docker wanted refurbishing, then refused to pay? She must have been a wonderful character..and to think I was in love with Lady Docker’s great niece!.. “When I were a lad…” it was my understanding that the Dockers flaunted their wealth so much, in very hard times, that it caused considerable resentment from the struggling Working Classes and poor. They appeared to revel in the publicity they sort, (similar to the Kate and Pippa Middletons basking in their acquired limelight?). The mink coats, huge diamonds and lavish cars emphasised the huge gap between the rich and poor. Were they not pressured by their peers, in the worried Upper Classes, to adopt a lower profile? Was Lord Docker’s demise as Chair of BSA due to the “gentry’s” fear of possible revolution with the rise of Communism in the East? To some extent the parallels are there in contemporary society, with growing resentment of today’s gap between rich and poor. With even more financial austerity forcing down the less well off, should the arrogant rich and affluent be afraid of the incubating anger in the general population? Are the recent riots the tip of an ice-burg and a prelude to things to come?